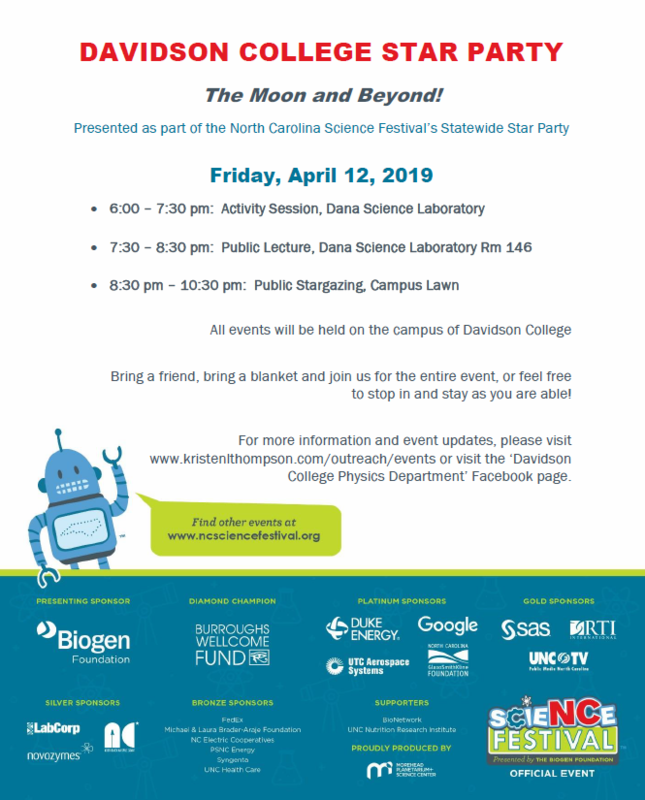 Update (4/12/19 1:07 pm): Due to inclement weather, the stargazing portion of the Davidson College Star Party will be cancelled for Friday, April 12th. However, the activity session and public lecture are indoors and will go on as scheduled. Please join us for some rainy-evening astronomy fun! 6:00 – 7:30 pm: Activity Session in the Dana Science Laboratory, featuring family-friendly demonstrations, crafts, and activities. 7:30 – 8:30 pm: Public Lecture in the Dana Science Laboratory in room 146, topic and speaker to be announced soon. 8:30 – 10:30 pm: Public stargazing on the campus lawn, featuring telescope observations and guided tours of the Moon, stars, galaxies, nebulae, and planets. Bring a friend and a blanket and relax while your take time to simply look up. 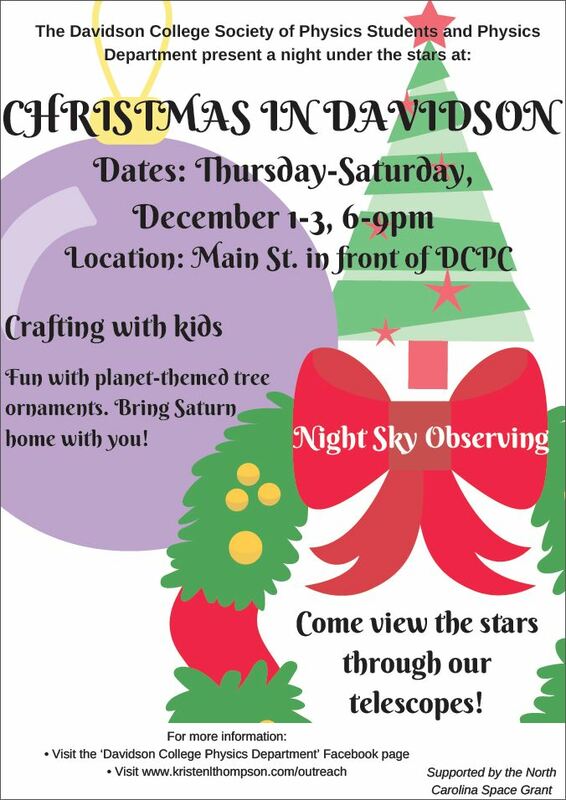 Please note that the stargazing portion of the event is weather permitting. In case of questionable weather conditions, check back here for weather updates or on the Davidson College Physics Department Facebook page. All other events are not weather dependent and will proceed as planned. 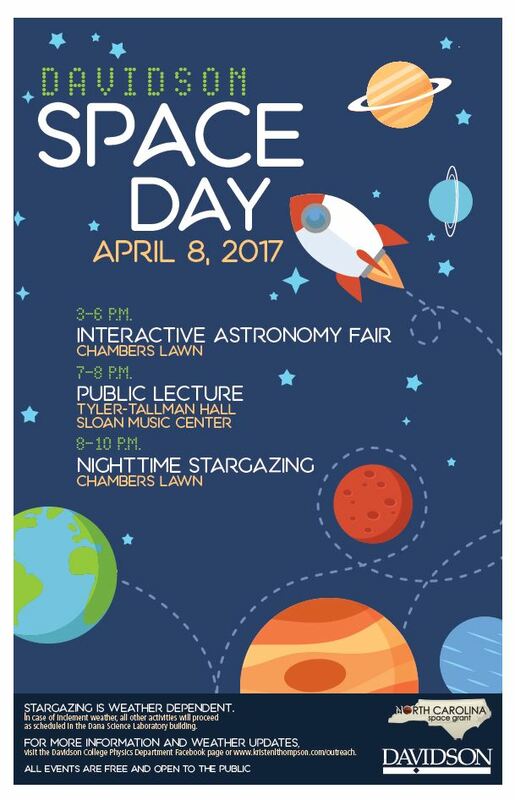 3 – 6 pm: Find us on Chambers lawn for an interactive astronomy fair during which you can explore various astronomy topics through numerous activities and demonstrations. Why does the Moon appear to change shape? Do humans glow in the dark? Are all stars like our Sun? What is a black hole like? Come learn the answers to these questions and more! You can also walk our scale model of the Solar System, safely view the Sun through our solar telescopes, play some fun astronomy themed games, and take home some fun crafts! In case of inclement weather, the fair will be held indoors in the Lilly Family Gallery. 7 – 8 pm: Get off of your feet and relax for a few minutes while you enjoy a public lecture in Tyler-Tallman Hall of the Sloan Music Center. NASA Solar System Ambassador John O’Neal deliver a talk entitled “The Past, Present, and Future of the NASA Parker Solar Probe.” The talk will be appropriate for all ages. Rain or shine, the show will go on. 8 – 10 pm: Following the public lecture, and after the Sun has set, wind down and join us for nighttime stargazing and guided tours of the sky through our telescopes from Chambers lawn, weather permitting. You will be able to gaze upon celestial objects such as planets, stars, nebulae, and galaxies with your own eyes and learn about the springtime constellations. Due to the nature of astronomy, the stargazing portion of the event will be canceled in the case of poor weather and/or cloudy sky conditions. If the weather is questionable on the night of the event, either check back here or visit the ‘Davidson College Physics Department’ Facebook page to find weather and event updates. 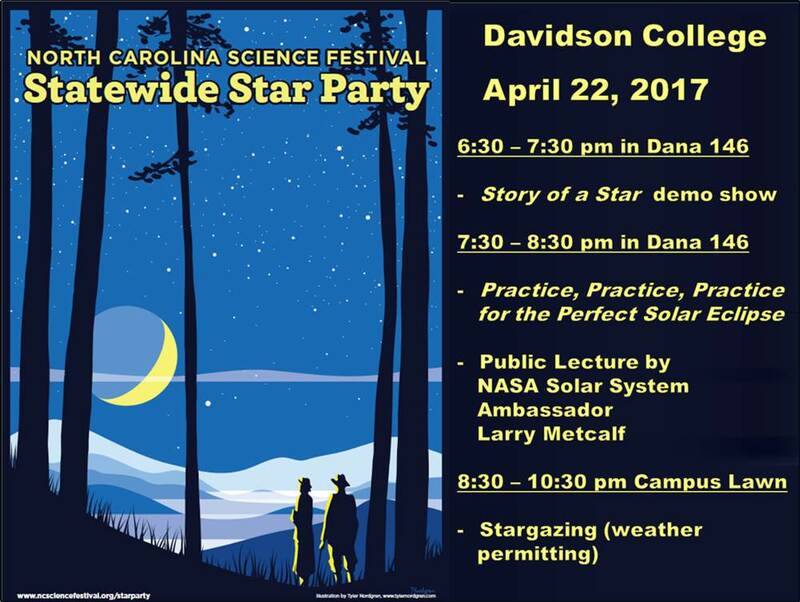 The Davidson College Physics Department and Society of Physics Students invite you to a Star Party to be held on the evening of Friday, April 27th, 2018 from 8:30 – 10:30 pm on the campus lawn. Physics students and faculty will be on hand to offer guided tours of the nighttime sky through our telescopes. The event is FREE and open to the public. Bring your family, friends, and a blanket to spread on the lawn. Feel free to come and stay for the entire event or spend just a short time looking through the telescopes. Due to the nature of astronomy, the Star Party will only be held in the case of clear skies. If the weather is questionable on the date of the event, please check for event status updates at this site or the ‘Davidson College Physics Department’ Facebook page. A printable event flyer can be found below – please feel free to print and distribute to those who may be interested. If you have any questions or would like more information, you can contact me via phone or email (see my contact page). A campus-wide eclipse celebration will be held on the day of the Great American Eclipse, which also happens to be the first day of classes for the 2017 – 2018 academic year! All students, faculty, and staff will receive a free pair of solar glasses to safely observe the Sun during the eclipse, which will be seen as approximately 97% total from campus.After taking part in an eclipse-themed lunch in Vail Commons, bring your eclipse glasses to Chambers Lawn from 2:30 – 3:00 pm to view the eclipse with a few thousand of your closest friends, professors, and colleagues! Let’s make this the single most-attended event by the campus community in Davidson history! Location: Garden Street Park Ballfield, Winnsboro, SC – Located at the corner of N. Garden Street and Drayton Street. Note that this is NOT where your GPS will bring you if you use ‘Garden Street Park’ as your destination. Event Parking: There is no way to guess how many visitors will join us for this event. As Winnsboro is a small town, there is a lot of street parking and small lot parking. Winnsboro police will be out directing parking near the ball field. Overflow parking will be available at the old Walmart Shopping Center located at the corner of the 321 bypass and Ninth Street. A parking attendant will be there, and a free shuttle service to and from the ball park will be provided from 12 noon – 5 pm. Professor Robert W. Prentiss of Rutgers College presented an evening lecture entitled The Sun and the Coming Eclipse at the courthouse in Winnsboro two days prior to the 1900 eclipse. According to The Fairfield News and Herald, “The admission fee [was] 25 cents for adults and 10 cents for children. The first twenty dollars of the proceeds will go to Prof. Prentiss and the balance to Mt. Zion Library.”For the Great American Eclipse, I will present a public lecture by the same name as that delivered by Professor Prentiss – The Sun and the Coming Eclipse. Join us to hear about the 1900 eclipse expedition, how to view the eclipse safely, and what to expect during totality. Unlike the lecture from 1900, this event is FREE and open to the public. No tickets or advance registration is required. However, if you would like to donate 25 cents per adult and 10 cents per child, we would be happy to donate all proceeds to the library as well! 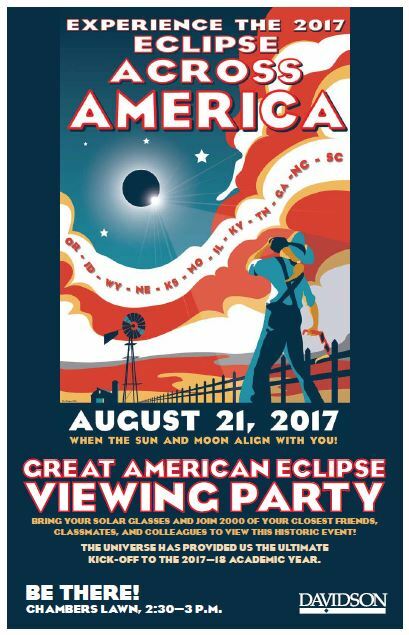 Take part in this outing to learn about the upcoming solar eclipse! The event will begin with a short presentation about solar eclipses, how to safely observe them, what you can see during the eclipse from Davidson, and how the partial eclipse experience compares to that of totality.The outing is for children 7 years of age and older and their families. Pre-registration is required. to register, send an email to dlc.wow@gmail.co with the names of all participants (parents and children), ages of the children, any allergies, and a phone number. Additional event details will be sent to those with a confirmed registration. On May 28, 1900, a total solar eclipse passed through the small town of Winnsboro, SC. Davidson college professor and future College president Dr. Henry Louis Smith, along with astronomers from a number of other universities, took part in an expedition to the small town to observe and study the eclipse. During the 19th and early 20th century, it was common for American universities to assemble such expeditions to study the Sun and physical phenomena during eclipses. 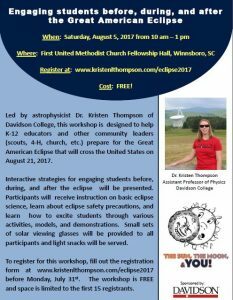 Of all of the great eclipse expeditions of this era, there are only 2 observing stations that are in the path of totality for the 2017 Great American Eclipse, and Winnsboro, SC is one of these! 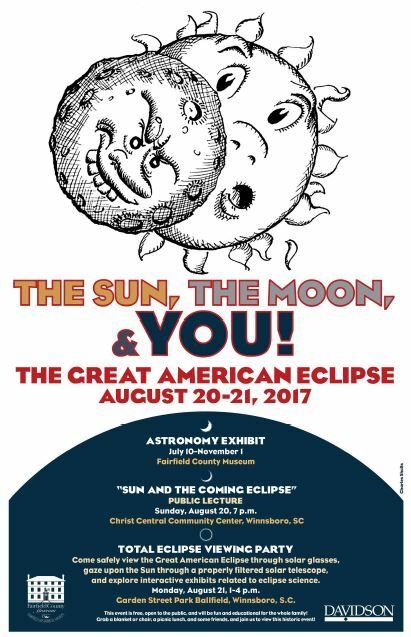 This museum exhibit commemorates the history of the 1900 eclipse and the connection to Davidson College via Dr. Smith, while also celebrating the 2017 Great American Eclipse. Stop by the museum to view a 19th century telescope and various historical letters and documents connecting the small town of Winnsboro to such an important piece of scientific history! Weather update (4/22/17 at 12:32 pm): All weather forecasts are currently calling for cloudy conditions and a chance of thunderstorms tonight. Therefore, we anticipate that the stargazing portion of our Statewide Star Party event will need to be cancelled. However, we will still have our interactive demo show ‘Story of a Star’ at 6:30 pm and our public lecture by NASA Solar System Ambassador Larry Metcalf entitled ‘Practice, Practice, Practice for a Perfect Solar Eclipse at 7:30 pm, as originally planned. Both events will be held in Dana 146. Please join us! 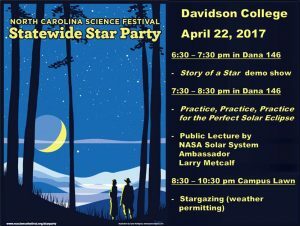 Please join us on Saturday, April 22nd as Davidson College serves as a host site for the 2017 North Carolina Science Festival’s Statewide Star Party! We will offer a trio of programs as part of this event. As always, all events are free and open to the public! Story of a Star – Come learn all about stars during this interactive demo show! We will discuss how stars form, how they live their lives, and what makes them unique. This event will be fun and educational for all ages! Practice, Practice, Practice for the Perfect Solar Eclipse – NASA Solar System Ambassador Larry Metcalf will deliver a public lecture about the science of eclipses as well as how to safely view and photograph the phenomenon. This is a perfect way to prepare for the total eclipse that will be passing through our area on August 21, 2017! 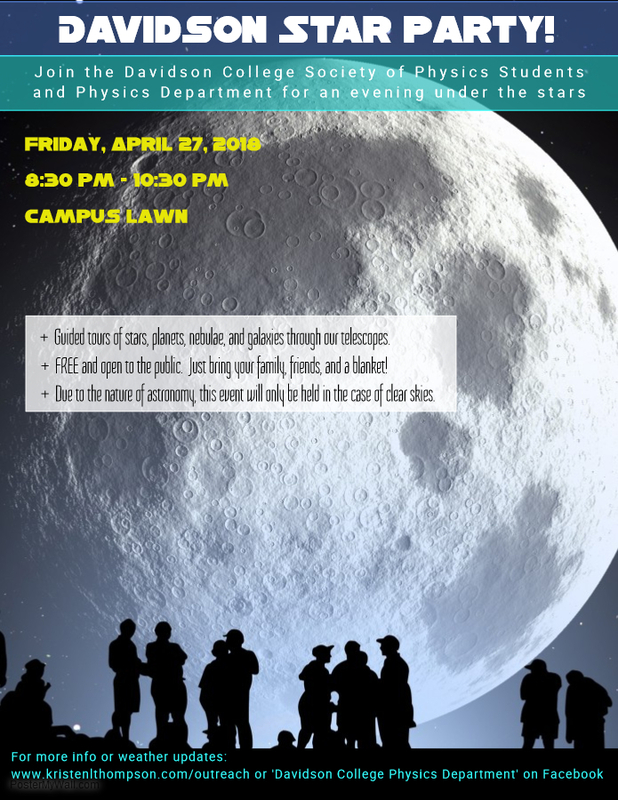 Stargazing – Join us for stargazing on the Campus Lawn. You will be able to view planets, stars, and galaxies through the Physics Department’s telescopes. Bring some friends and a blanket for a fun-filled night of stargazing. This portion of the event is weather permitting. In case of questionable weather conditions, check back here or at the Davidson College Physics Department Facebook page for updates on the day of the event. We had a great day with great fun and great weather! Thanks to all who stopped by. Look for Davidson Space Day Version 2 next spring! 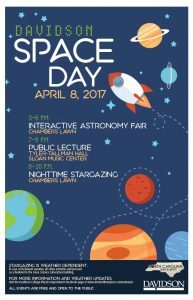 3 – 6 pm: Find us on Chambers lawn for an interactive astronomy fair during which you can explore various astronomy topics through numerous activities and demonstrations. Why does the Moon appear to change shape? Do humans glow in the dark? Are all stars like our Sun? What is a black hole like? Come learn the answers to these questions and more! You can also walk our scale model of the Solar System, sample some liquid nitrogen ice cream, safely view the Sun through our solar telescopes, and take home some fun crafts! In case of inclement weather, the fair will be held indoors in the Dana Science Laboratory Building. 7 – 8 pm: Get off of your feet and relax for a few minutes while you enjoy a public lecture in Tyler-Tallman Hall of the Sloan Music Center. NASA Solar System Ambassador Jack Howard will discuss the recent TRAPPIST-1 system discovery and where it fits into the search for Earth-like planets. A title and abstract for the talk will be posted soon. The talk will be “low tech” and appropriate for all ages. Rain or shine, the show will go on. 8 – 10 pm: Following the public lecture, and after the Sun has set, wind down with nighttime stargazing and guided tours of the sky through our telescopes from Chambers lawn, weather permitting. You will be able to gaze upon celestial objects such as planets, stars, nebulae, and galaxies with your own eyes and learn about the springtime constellations. Due to the nature of astronomy, the stargazing portion of the event will be canceled in the case of poor weather and/or cloudy sky conditions. If the weather is questionable on the night of the event, either check back here or visit the ‘Davidson College Physics Department’ Facebook page to find weather and event updates. Bring your family, friends, and a blanket to spread on the lawn! Feel free come and stay for the entire event or spend just a short time looking through the telescopes. A printable event flyer can be found below – please feel free to print as many copies and you wish and distribute to those who may be interested. If you have any questions or would like more information, you can contact me via phone or email (see my contact page). Thanks to all who visited us to look through our telescope and make a Saturn and/or wire star Christmas ornament! The Davidson College Society of Physics Students and Physics Department presented a star party in conjunction with the 2016 Christmas in Davidson celebration. We set up along Main Street in front of the Davidson College Presbyterian Church. We had three great nights of stargazing and crafting with the community! If you missed us this year, be sure to find us in 2017! The flyer from the event can be found below. We had wonderful time at this event! Thanks to Dr. Brad Barlow for visiting us! The Davidson College Society of Physics Students and Physics Department invite you to a Star Party to be held on the evening of Thursday, September 29th, 2016. 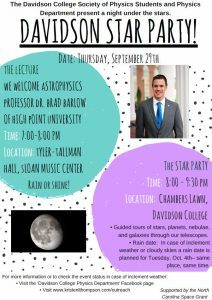 We will kick of the event with a public lecture by Dr. Brad Barlow of High Point University. His talk is entitled “US 708: The Most Extreme Hypervelocity Star in the Milky Way.” The lecture will be held in Tyler-Tallman Hall at 7 pm. After the lecture, join us as we set up telescopes on the front lawn of campus to view various stars, planets, nebulae, and galaxies. Physics students and faculty members will be on hand to give you a tour of the sky and answer questions. The event is free and open to the community. Bring your family, friends, and a blanket to spread on the lawn. Feel free come and stay for the entire event or spend just a short time looking through the telescopes. The lecture will be held on September 29th regardless of weather. 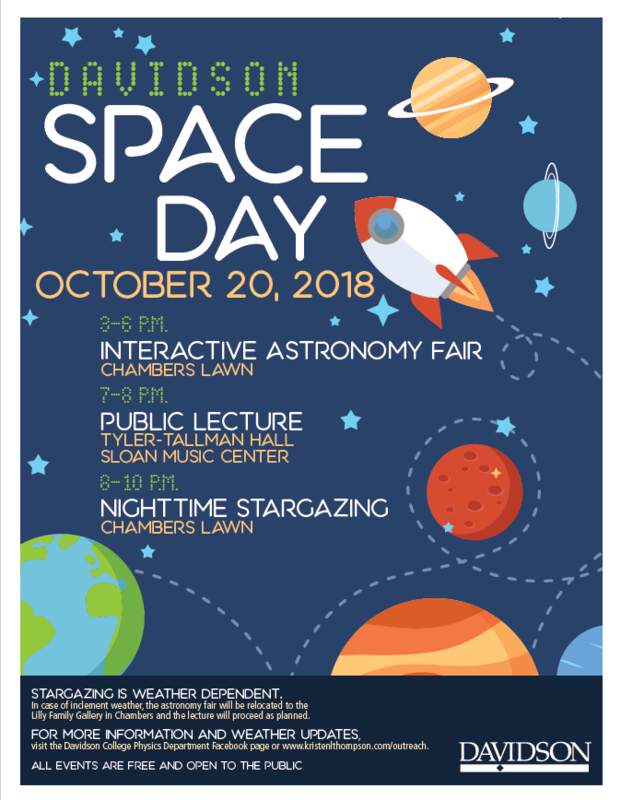 However, due to the nature of astronomy, the stargazing portion of the event will be postponed in the case of inclement weather or cloudy skies. A rain date for stargazing is scheduled for Tuesday, October 4th – same place, same time. If the weather is questionable on the date of the event, please check for weather and event status updates either on this webpage or on our ‘Davidson College Physics Department’ Facebook page. Although it was a bit cloudy, we were able to get a few good peaks of Mercury! See you in 2019 for the next transit! On Monday, May 9th, Mercury’s path through the sky will cause it to pass between the Earth and the Sun. This event, called a transit, will allow viewers on Earth to see the tiny planet moving across the disk of the Sun. These events are relatively rare, with only about 13 Mercury transits occurring every century. This will be the first transit of Mercury since 2006, and the last until 2019. It is important to remember that you should never look at the Sun without proper filters – and no, sunglasses are not proper filters! If you wish to view this event, you must be very careful and be sure to protect your eyes. The best way to do this is to come visit us! Since the planet Mercury is only 1/194th of the Sun’s apparent diameter you will not be able to see the transit without the unaided eye. You will need the help of a telescope or pair of binoculars that are properly equipped with adequate filters to ensure safe viewing. The Physics Department owns two dedicated solar telescopes made exclusively for the safe viewing of the Sun. 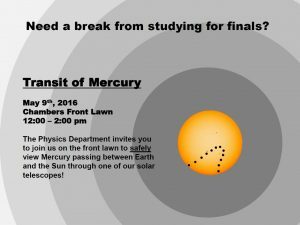 Join us Monday, May 9th on the Chambers front lawn from 12:00 – 2:00 pm to view the transit! Note that the sky must be clear to see the transit – if you can’t see the Sun, you can’t see Mercury! We had a huge turnout at this event! Thanks for all who attended! Our biggest event of the year! 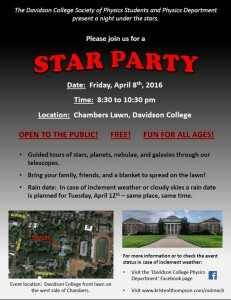 The Davidson Physics Department partners with the Davidson Land Conservancy and the Charlotte Amateur Astronomy Club two times a year (spring and fall) to host a stargazing party at Fisher Farm Park, just outside the Town of Davidson. This year, the spring event will be held on Friday, April 29th from 8:30 – 10:30 pm. Physics faculty and members of the Society of Physics Students will set up several telescopes and a set of binoculars to view a variety of targets throughout the night. Members of the Charlotte Amateur Astronomy Club will also provide several telescopes for viewing. Bring your family and friends for a fun night of stargazing! As with all stargazing events, clear skies are essential. In the case of cloudy skies, the event will be canceled until our next star party in the fall. If weather is questionable, you can come back to this page on the day of the event to check the weather status and find out if the event will be held. Thanks to everyone who came out for the Star Party Friday night. The event was a great success, even though we occasionally had to peek through the clouds. We look forward to our next event! 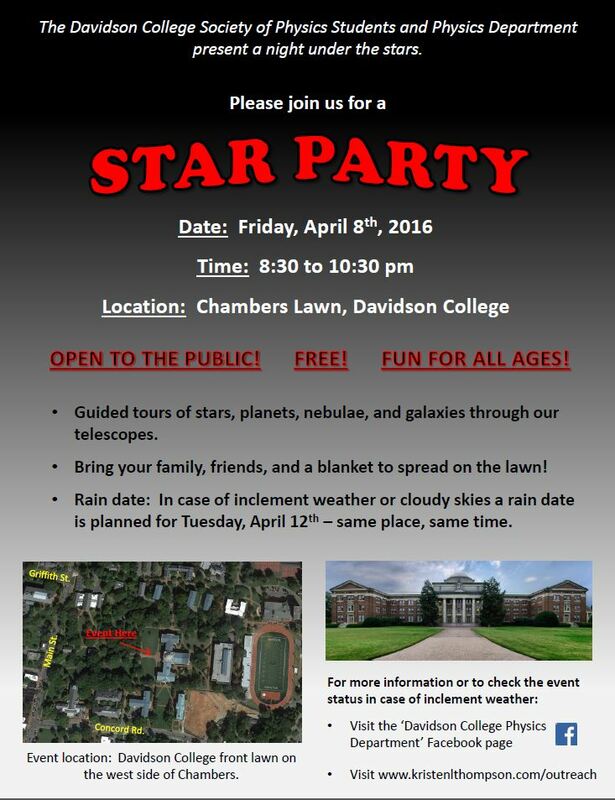 The Davidson College Society of Physics Students and Physics Department invite you to a Star Party to be held on the evening of Friday, April 8th, 2016 from 8:30 – 10:30 pm. 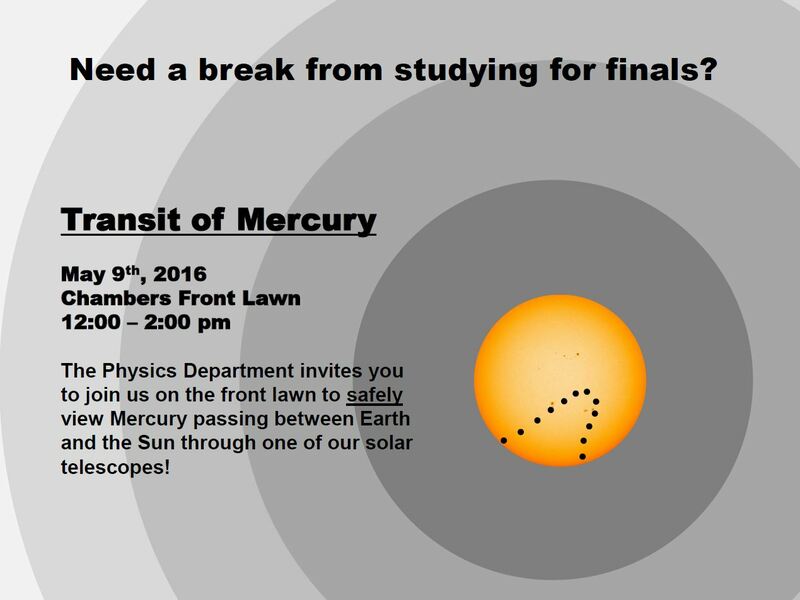 Join us as we set up telescopes on the front lawn of campus to view various stars, planets, nebulae, and galaxies. Physics students and faculty members will be on hand to give you a tour of the sky and answer questions. The event is free and open to the community. Bring your family, friends, and a blanket to spread on the lawn. Feel free come and stay for the entire event or spend just a short time looking through the telescopes. Due to the nature of astronomy, the event will be postponed in the case of inclement weather or cloudy skies. A rain date is scheduled for Tuesday, April 12th – same place, same time. If the weather is questionable on the date of the event, please check for weather and event status updates either on this webpage or on our ‘Davidson College Physics Department’ Facebook page. Kristen L. Thompson | Powered by Mantra & WordPress.